It’s a question I (and others) have been asking a lot lately: Where is the middle? The Budget Knife has had its day: the Tenacious, the Cryo, the Skyline, the RAT-1, the Drifter; value was the byword of the industry, and knife makers were showing some serious creativity and finesse working under the restrictive parameters of budget knife design. Similarly, 2015 saw the high end of the market really take off, with a stream of great $150 announced and released. The materials were different – S35VN and titanium instead of 8Cr13MoV and black polymers – but the feverish pace of invention and the way in which our expectations for quality were reset were the same. But the middle was more or less ignored. Companies’ attention was clearly elsewhere, and this is a shame. Designs in the middle of the market (let’s say the $60-$100 range) are some of the historical best: things like the Delica and the Mini Gripitilian have good materials and great designs at an affordable price. If I were feeling polemical, I’d say that the middle of the market is the only segment in which you can shake the feeling of having to have compromised: with a budget knife, even a good one, you can’t help but think it could be improved with better steel or execution; with a high end knife, you feel like you’re paying a lot for only a little more performance. In the middle you can get, if not the best, the more-than-adequate of both worlds. Great design, great fit and finish, great materials and steel. Less compromise, more performance. But, there just aren’t a lot of designs coming out that cater to this segment; this is why Kizer’s Vanguard series, and in particular the Vanguard Gemini, excited me so much: this is a quality design, by a famous custom maker, at a very affordable price point. As soon as I was able to, I picked one up. But there are a lot of questions here: is it a good knife? Is it a good knife for the money? Is a good knife compared to the classics of the middle genre? Is it a better value than the premium version? The answers are complicated, and intertwine; so let’s get into it. The Gemini has a blade length of 3.125″, an overall length of 7/25″, weighs 3.58 ounces and is made in China. In terms of proportions, it is adequate if not distinctive. Where it really distinguishes itself from other knives like the Delica or the Mini Grip, and even from some Kizer stablemates like the 3404, is in its custom pedigree. The Gemini is a production version of Ray Laconico’s Jasmine. Really, the Jasmine is less a specific knife than a kind of overarching design or aesthetic, a series of lines and design nuances that are translated from one Laconico knife to another. Sometimes it’s a titanium flipper, sometimes it has a liner lock and a thumbstud, but always there’s a certain aesthetic in play, and I think this aesthetic comes through most clearly, on the various custom iterations and this production riff, in the blade shape. It’s a drop point, almost a Platonically ideal Loveless drop point except for its somewhat more elongate tip. Although this is a larger knife than the SRM 710, it too embodies an excellent, near perfect combination of edge types: you have your straight edge, your curving belly, your acute tip. You can slice, pierce, chop gracefully. The single caveat I have is that it isn’t the most robust blade, but in all reasonable use you’ll be delighted. For all around utility, this is up there with some of the best of the best. The Gemini’s blade is made from VG-10. Certainly VG-10 has fallen from grace in recent years. It’s a really weird steel. It holds an edge better than 8Cr13MoV or AUS-8, but worse than most other mid-tier steels like 154CM or N690Co – and it’s harder to sharpen well. You can get a functional edge back on VG-10 quickly, but to get it really fine you need to work on it for a bit. In short, it has an odd work-to-performance ratio, with no real standout characteristic other than its rust resistance – which, let it be said, is incredible. The choice of steel is one of a few budget conscious decisions Kizer made when producing the Vanguard Gemini, and probably the least successful of the three. The middle segment of the market doesn’t have a representative steel like 8Cr13MoV or S35VN are for budget and high end knives. There are candidates, like 154CM or N690Co, but nothing established – and, while I don’t hate it, I don’t think that VG-10 should be in the running. The Vanguard Gemini handle is G-10, as opposed to titanium on the premium version. And, to be frank, I prefer G-10 over titanium. Besides aesthetics, I don’t know what the argument is for titanium, now that I think about it. It isn’t warm to the touch, it isn’t lighter, it isn’t more durable in any practical sense. If the big advantage of titanium is that it allows for a framelock, that doesn’t sell it, as I find framelocks more or less strictly inferior at this point. The G-10 on the Gemini is real good. It is grippy, without being outrageously aggressive. It accentuates the simple utility of the straightforward handle, giving you purchase no matter how you’re holding the blade. Compared to the Delica, which has a refined although somewhat dictatorial handle, you have a lot more freedom in terms of how you hold the Gemini. Reviewing the 3404, the biggest issue I took with the knife besides its overall blandness was the horrible pocket clip. Kizer seems to have learned a lot about pocket clips in the time between the design of that knife and this one, because the clip on the Gemini, in terms of its lines, is very good – smaller than it looks like in pictures, but not in any way that affects carry. What does affect carry is the clip’s tightness. It’s not terrible, but it can be a pain to pull out of your pocket. I kind of had to pull it out diagonally, in order for my jeans to not get bunched up. It’s not ideal, but I’ll take this minor inconvenience over the atrocious clip on the 3404, every day. With the Vanguard Gemini’s flipper, instead of building to a price point Kizer went all out. The flipper on the Vanguard Gemini is as good a flipper as I’ve ever used. The combination of ball-bearing pivot and silky, perfectly-tensioned detent (complete with ceramic detent ball) makes for nearly effortless deployment. Seriously, I had to go out of my way to deploy this thing incorrectly, it’s that responsive. I don’t think there’s any practical advantage to a flipper design, but like any knife collector, I am susceptible to fidget factor, and the Gemini is absolutely hypnotic and addicting to play with. It makes knives that I thought pretty fast, knives like the 3404, feel sluggish. I carried the Delica 4 again around the time I was testing the Gemini, and the laggardly lockback felt like the relic of a distant age. Because the Vanguard Gemini has G-10 scales instead of titanium, it uses a liner lock instead of a framelock – to my mind a straight upgrade. I’ve gone on at length before about my distaste for framelocks. I suppose I’ll find one I like at some point, but until then I’ll continue to espouse the liner lock as strictly better – and here on the Vanguard Gemini we have an excellent rendition of the form. In my experience, every knife I’ve owned has some bladeplay, or develops some over my review/testing period – even if it’s very, very little. So far on the Gemini, I’ve got nothing, and I didn’t baby this knife: a cardboard cut-off with the Delica 4 induced nothing at all. Things may change in the future but, as of now, this thing is solid. There are three different ways to look at the Gemini. First as the realization of the Kizer Promise. They were making good knives before the Gemini, but nothing that struck me as really top-tier, nothing that really stood out amidst the competition. But the clean, ineffable lines of the Laconico custom have been given a characterful production life by Kizer. If you had any lingering doubts about their legitimacy as a manufacturer, the Gemini will put them to rest. Second, we can compare the Vanguard Gemini to its higher-end iteration. I don’t think that it’s a question of one being strictly better than the other. I prefer G-10 to titanium and liner locks to framelocks, but S35VN is a better steel. The way I see it, there are a lot of other titanium framelock flippers with S35VN steel in the world, but there’s nothing that looks or flips like the $80 Vanguard Gemini. Third, we can look at the Vanguard Gemini as a knife in the depopulated middle price bracket. What is its competition? The old standbys, mostly: the Delica 4, the standard Mini Grip. And against these knives I’d say the Gemini falls in the middle: I think all three are excellent designs and great users. It’s largely a matter of personal preference, but the Gemini, with its luxe flipping action and top-tier finish, feels a little nicer than either. Regardless of where it falls in the overall middle price bracket hierarchy, the Vanguard Gemini is exciting precisely because it brings something new to this much-neglected segment of the market. It routinely sold out online. Maybe it will lead the charge of a new mid-priced knife renaissance? Be a vanguard, of sorts, if you will? I recommend purchasing the Kizer Vanguard Gemini from BladeHQ or Amazon. Please consider that purchasing anything through any of the links on this website helps support BladeReviews.com, and keeps the site going. As always, any and all support is greatly appreciated. Thank you very much. Thanks for the timely review. I was thinking of picking one up as I prefer liner lock flippers in the three inch range. I wonder if it would be possible to swap the S35VN blade from the premium version of the Kizer Gemini with the VG10 blade of the Vanguard series. VG 10 probably isn’t subpar enough to justify the cost of buying both knives necessary to do so. This is a must-buy if liner lock flippers are your thing. That’s an interesting thought about the blades. I haven’t looked under the hood on either model to learn if they’re swappable. But yeah, VG-10 isn’t so bad as to make it worth investing $260 to get rid of it. It is a bummer that it’s s Kizer’s go-to budget steel though. N690Co would’ve been incredible here. Thanks for a fine review of a wonderful knife. The G10 Kizer Gemini makes a great EDC. I slightly prefer it to the Ti version, which I also love. Plus, it’s a steal at the price. I also own the Kizer Vanguard Intrepid. The quality of both Vanguard models is top-notch. Love your suggestion about using N690 steel. Kizer’s hookup with Ray Laconico, a hot knife designer, has turned out to be a match made in heaven. In the future, I hope Kizer will offer more models in the 3-inch range. I’ve read that Kizer has an American-based support center. If so, I’d like to know more about it. One of the best things about Kizer is that all of their models, premium or Vanguard, feature the same exacting level of fit and finish. You aren’t ever making a compromise in that regard when you jump down to the more affordable models. The Laconico collab was definitely a good move on Kizer’s part. Not the first time they worked with a custom maker, but the first time everything really came together for them and for consumers, I think. I’ve heard the same thing about a support center, but nothing more than it’s in the works. I know they’ve had website issues lately and are in the middle of/just wrapping up a change of facilities, but it looks like emailing them at service@kizercutlery.com is currently the best option. Wow, this is a really well-written review! One of my favorites on the site so far. The discussion of Laconico’s jasmine design is the highlight ,I think. The one advantage to titanium is that it tends to be easier on the pockets than g10, even the “gentler” g10. That said, I agree with your opinion that liner locks are, in general, superior to framelocks. The Jasmine is a fun design to talk about. I really like the way it looks, and there’s something about the blade shape that gives the otherwise simple design a real dose of character. That is definitely one upside to titanium. I think G-10’s shreddiness can be ameliorated somewhat if the clip is designed right, both in terms of tension and in terms of the overall size of the contact point between it and the handle scale. On the Gemini that point is fairly small and acute, so the Vanguard Gemini puts more wear on the pockets than my PM2, and much more wear than its premium brother. I would still like to experience a truly great titanium framelock. I have a Mantra inbound, maybe it will be the first. If anybody can make a good framelock, it’s Spyderco’s Taichung manufacturer. I’ve had a Mantra for about 2 weeks, and I don’t think you’ll be disappointed. It’s not flashy or super cutting-edge; however, what you get is a simple, clean, classic Spyderco blade and handle with great steel, great flipping action(IMO), and impeccable build quality. I look forward to you or Dan(or whomever) doing a review on it for this site. That’s exactly what I’m looking for. Hope I like mine as much as you like yours. I’ve had a love/hate relationship with the Delica for a long time that finally landed love side up, so I like the idea of a bigger, titanium Delica with M4 and a flipper. Wow, more pocket shreddy than the PM2 is saying something. I really thought the techno was a great ti framelock, so I can imagine the mantra will be great as well. Yes, the Gemini’s G-10 has a much bigger grain than the PM2’s close crosshatch, and it is definitely toothier. But keep in mind that the only other G-10 knife I’ve regularly carried lately has been the Mini CQC-7, so my perception of the PM2’s relative ‘shredditude’ may be somewhat skewed. Was this article written by Dan? It says it is at the top, but the whole time I was reading it I didn’t think it sounded like Dan. Now I’m seeing Benjamin Schwartz responding to comments. Is this actually a Schwartz article or am I just losing it? Ben wrote it, and I forgot to change the authorship. Thanks for pointing that out. Very sensible package. This knife is somewhat testing my resolve not to buy PRC-made knives over $50. It’s even available in green G-10… nice. I find the curvy-smooth Ti Gemini a little too feminine looking in comparison. Agree that framelocks are overrated. In particular, liner locks and flippers go together like sauteed mushrooms and pinot noir. The only Ti framelock that has completely pleased me is my Chris Reeve Mnandi (by the lock’s inventor), which engages fully, has substantial lockbar tension, and no blade play. Regarding VG-10, I always wonder if it is persistently heat-treated too soft? Just a thought. There are still some VG-10 knives I love to carry (Caly 3.5 G10) but I carry them for their design and handling, not the steel. AUS-8 is a more likeable package 90% of the time. P.S. : It’s remarkable how 3.125″ has become the new 2.9″. It’s a great blade length for trading off compactness with utility. (That said, I live in a fairly pro-knife state; the only limit I sometimes bump up against is 4″, which doesn’t exactly chafe for EDC. The three-and-a-smidge trend makes me sorry for people in <3" length limit jurisdictions, which aren't uncommon. They had more choices back when the Delica was the EDC norm. There've been several recent high-end Spydercos with their blade lengths listed as 3.01" or 3.03" — at that point I feel we're verging on d*ck move territory). I think it’s worth going a little over your $50 limit for this one. Trust me when I say that the F&F is about as good as on any production knife I’ve handled, and the flipper is just ridiculously smooth and fun. I have yet to handle a CRK knife for more than a minute, but I would expect nothing less than perfection given their reputation. I think geometry and tension have to be spot-on with frame locks, but additionally have to be able to stand up to the wear and tear of time and use. I would prefer AUS-8 as well, although I would feel a little weird paying $80 for it – stupid, I know, but there it is. I can’t find any info on Kizer’s heat treat but I worry that going harder will make sharpening even more of a pain. Spyderco’s VG-10, which seems to be run a little soft, is a bear to work with as is. If I can make a sweeping statement I’ll say that I would be happy to see it just kind of leave the industry. That being said, I too will happily carry a knife with VG-10, if it is a good blade otherwise – as this one is. Legality aside, I’m coming around on 3+” blades myself. The Gemini, among other recent acquisitions, has shown me that there are tangible advantages to the extra length. And bigger blades usually mean bigger, more comfortable handles, which I’m all about. Any experience with the Intrepid Vanguard? I am on the fence with which version to buy, the Gemini or the Intrepid. Unfortunately not. Maybe someone else will chip in, but my guess would be the Gemini is a better slicer than the Intrepid, so for regular everyday stuff it gets my vote. But you can’t go wrong with either. I own the Intrepid and Gemini in both Ti and G10. All four are top-notch and recommended. My favorite is the G10 Gemini — for size and weight; slicing ability; and G10 scales with just the right amount of grippiness. Undecided? You could make your choice on size. 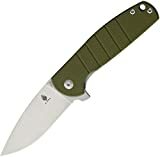 In my opinion one of the best brands that may qualify for “middle ground” is a relatively new brand named Real Steel.This brand produces knives out of China,but they are NOTHING like the typical China made knives.Real Steel primarily uses Sandvik 14c28n steel for their folders,as well as D2 and 440c for some of their fixed blades.Most Real Steel knives are under $60 and their quality,fit/finish,attention to detail,ergonomics,etc. are on par with any $75-100 knife on the market today. I’m glad to hear some positive feedback about Real Steel. I have been curious since they first showed up, but haven’t pulled the trigger on anything yet. It’s hard for me to go in blind on a new company. When the mood strikes I’ll pick up one of their blades and see how I like it. I notice that one of their designs is from Sanrenmu, I wonder if this is SRM’s attempt to break into the knife market outside of China. Hey Ben, very nice review. I just bought a Kizer Gemini today. I paid 75 dollars for mine and really like it so far. My question is about the durability of it. Would you consider it a hard use knife that would hold up well for a long time? I am only asking because the handles seem a little on the flimsy side. Thanks for the very kind words, I’m glad you liked the review – and I’m glad you’re enjoying your Gemini. To answer your question, I wouldn’t consider the Gemini a hard use knife by design. It’s more of a general purpose EDC knife. However, I can tell you that the materials, while humble, are extremely durable and the construction is sound. Your Gemini could probably stand up to some harder use if the need arises, and in terms of general wear and tear/longevity, you’ll get years and years out of it. Use with confidence. Nonsense. N690Co is a European copy of VG-10, but with lower attainable hardness, i.e. lower edge stability. 154CM doesn’t get as hard as and has larger carbides than VG-10 (again, lower edge stability). Spyderco give VG-10 an abysmal heat treatment in the Delica line but it’s hardly the steel’s fault.